Your donation today will go towards the Alternative Break Scholarship program. What will your gift help us do? Equip students with leadership training. Allow exploration of outdoor service in a safe and inclusive environment. Expose the next generation to potential careers in land management and conservation by pairing groups with industry experts. P.S. Get a free gift when you donate! 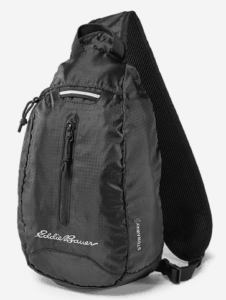 Donate $75 or more and receive this Eddie Bauer 10L sling pack. receiving the Swiftwick socks and minus an additional $50 if receiving the Osprey pack. Please allow 6-8 weeks for delivery.